Guests must present the same day Cotai Water Jet ferry ticket for this offer, the Eiffel Tower entrance located on level 5 via souvenir shop. 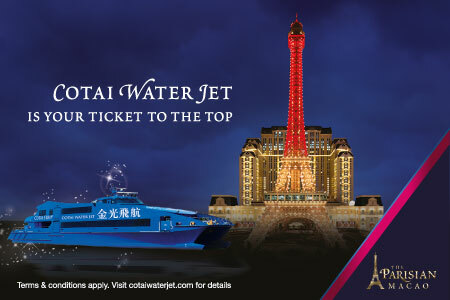 Each Cotai Water Jet ferry ticket entitles one (1) entry to the Eiffel Tower level 7 Observation Deck. Each guest may only use one (1) Cotai Water Jet ferry ticket. Cotai Water Jet ferry ticket will be collected by staff upon use. Offer is valid until 30 Jun 2019 (Black-out Period: 1st – 2nd January 2019, 2nd – 10th February 2019, 5th – 8th April 2019, 19th – 22nd April 2019, 1st – 5th May 2019, 7th – 9th June 2019, 29th – 30th June 2019). Eiffel Tower will be closed from 26th December 2018 to 1st January 2019. Cotai Water Jet ferry ticket that is mutilated, altered, copied, hand printed, forged, water damaged, manipulated, tempered with or stamped will be considered NULL and will Not be eligible for any usage.